As climate change research evolves, some areas of study become more popular and apparent than they were in the past. Gas exchange is one of these disciplines, and has been previously overlooked. To provide a boost of awareness to gas exchange research, a team of young videographers put together a three minute video-abstract highlighting the research of Dr. Penny Vlahos (UCONN) and her associates. The ocean and the atmosphere are both fluids. As these two fluids interact at their meeting point (the ocean surface) they diffuse into each other. As wind speed, wave height, and other disturbances to the system appear, the rate of gas diffusion rises. This relation is known as gas exchange, and by exploring the different components of these interactions, we can better understand the course of our future climate. In one particular series of experiments, scientists measured the rate that carbon dioxide dissolves into the ocean according to different wind speeds. Just as predicted, as the wind speed rose, the amount of dissolved carbon dioxide and the rate at which it dissolved both rose as well. This trend continued upward indefinitely. Other gasses, such as di-methyl sulfide, behaved differently, as their rates of dissolution plateaued after a certain wind speed and did not continue upwards. The significance of these observations is startling. Carbon dioxide, when dissolved in water, forms carbonic acid. Although weak in comparison to other acids, carbonic acid acts upon certain calcium based structures and other biotic entities in the ocean. 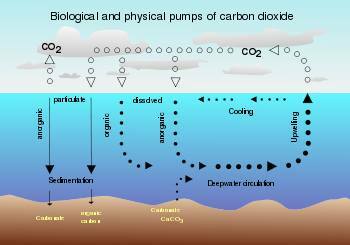 As weather patterns become more violent, the amount of dissolved carbon dioxide will rise significantly, as will the amount of carbonic acid in our oceans. Some may know this phenomenon as “ocean acidification” and it threatens our ecosystems with severe damages. Understanding gas exchange provides us with extremely important information for climate models, and helps us to make accurate predictions for the future of our planet. There are articles and papers on gas exchange scattered throughout the web, and I personally suggest reading through a few to achieve a higher understanding of the environment we so dearly need to protect. Gas exchange is more than a scarcely discussed relation, as it is one of the keystones to the planet on which we reside.